Mourning is for the living. It enables us to process grief, understand loss, and above all, invite healing. History is full of rich and meaningful mourning customs, indiscriminate of cultures, because how else could we possibly move on? In a way, mourning the loss of life promises our own survival. It is for this reason, I believe, mourning is a human right. On November 24th, the Sri Lankan government issued a statement denying permission for Maaveerar Naal commemorations to take place “on any occasion”. This day of remembrance, held by Tamil people in the North-East and across the diaspora, honours the fallen fighters of the Liberation Tigers of Tamil Eelam (LTTE). Lamps are ignited, blood donations are conducted, and graveyards are polished to honour those killed in the struggle for Tamil liberation. In 2016, Maaveerar Naal was observed by Tamil asylum seekers held in detention at Nauru Island—Australia’s unconscionable offshore processing centre for refugees. The first Maaveerar Naal was held in secret. On November 27, 1989 600 LTTE cadres gathered in the jungles of Manal Aru in the Mullaitivu district to remember their fallen comrades.This date marked the death anniversary of Lt. Shankar, the first LTTE cadre to die in combat in 1982. At precisely 6:05 pm, his time of death, a flame was ignited in his honour, and for the 1300 cadres who died after him. This tradition persisted as commemorations amplified and violence worsened. LTTE cemeteries, thuyilum illams, were constructed across the North-East, where families of the dead cadres would congregate in song and mourning. November’s end became a time for their pained remembrance, immense grief, and collective healing. The symbol of Maaveerar, the karthigai poo (Gloriosa lily), also bloomed at this time, sprouting jagged petals—bright yellow and soft red—like a bursting flame. Since defeating the LTTE in 2009, the Sri Lankan government criminalized Maveerar Naal and began to systematically destroy thuyilum illams. This act of structural genocide served to reassert Sinhala-Buddhist supremacy in the North-East and dehumanise Tamil attempts at remembrance. Without space or freedom to mourn Tamil people were denied a simple sustenance to living. In July 2010, Koppay’s thuyilum illam was razed to the ground and a Sri Lankan army base was built on top of it. This was the last remaining war cemetery in the Jaffna peninsula, and held over 2000 graves. By March 2011, the new headquarters of the Sri Lanka Army’s 51 division existed over the bodies of Tamil martyrs, making clear, Sinhala state preservation was dependent on the disposability of Tamil people. In spite of such violent efforts to eliminate Tamil resistance—remembrance continues. This week, Tamil people in Koppay erected a monument opposite of the former thuliyum illum, amidst overwhelming military and police surveillance. Two army trucks blocked entrance to the once expansive LTTE cemetery, yet commemorations persisted on the open road. In fact, this year saw many thousands of people commemorate Maaveerar Naal in Kilinochchi, Batticaloa, Puthukudiyiruppu, Vanni, and other regions in the face of extreme threats by the government. Destroyed fragments of tombstones were constructed into makeshift monuments and massive lines formed before them. 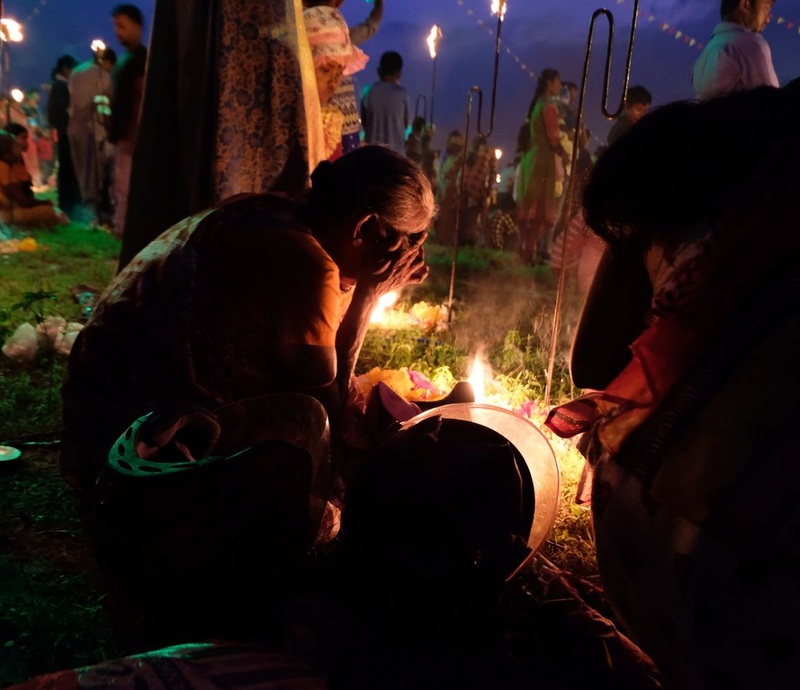 In Tamil tradition, families of the dead cadres prepared the favourite dishes of their lost loved ones and laid them on the ground without proper place to put them. This remembrance extended across the diaspora and was observed in Canada, England, and Australia amongst others. I believe it looks like collective mourning and fierce remembering. It looks like uncovered graves and resurrected monuments because ours is a history too pained to abandon. It looks like the unified spark of a flame at 6:05 pm.